Keep business moving forward with this eye-catching luggage tag! 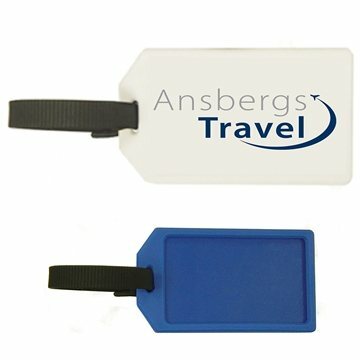 Featuring plastic construction with an adjustable strap, this travel necessity includes a window on the back for identification or inserting a business card. Add your company name or logo and give them out at the next convention you attend. A fitting promotional item for not only hotels and travel agencies but colleges and retail stores as well. Does not include ID card. our customers like them, some love them we are happy with the quality & the turn around time and the price too. I am very very happy with your company. I will continue ordering from your company. I liked the quality and price. we were very happy and satisfied with the quality of the product. this product is very nice. It was more solidly built than I thought it would be. This can be a great item and various from others that I've come across. Veronica was great. She responded quickly to my questions. Good artists the product was wonderful. The quality and imprint are just wonderful.